As I walked through my kitchen a couple of weeks ago the light fixture fell from the ceiling and knocked me to the floor! I was not injured seriously, but I started pricing new light fixtures. Holy buckets they want a lot of money for cheesy made in China crap, I was looking at $600 to $1000 to replace it. For that kind of money I thought I could do better. This is the result, 2 led shop lights, mica, copper, walnut scraps, and a suspended ceiling light panel, cost around $120. The last photo shows the el cheapo chain that suspended the old light, the links are not welded and over the 25 years I’ve lived here, they opened up. Needless to say that chain is replaced with welded link chain. Nice work Bondo! Glad that old light fixture didn’t knock you for a loop! I made one for our kitchen a few years ago. I posted it on my projects page. Your fixture looks very heavy I hope it’s secured well. WELL DONE! Very sturdy BUILD too! I see that we share a common trait—OVERBUILDING! I am also very guilty of making it to outlive me! Beautiful results. 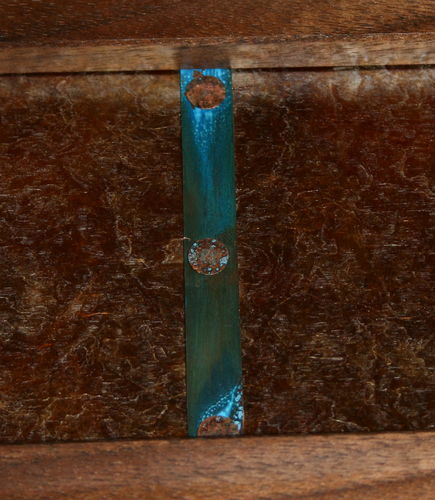 I can’t tell from the photos, what are the iridescent blue colored strips? They are copper strips, salted and fumed in ammonia. Purely decorative. This is great! I want to make one for my kitchen just because they look good, and all my fixtures are working fine. Nice work. I cheaped out on a ceiling fixture for my office room. I think I spent $120 – the biggest, cheapest one I could find on amazon, and holy toledo is it a piece of crap. Light fixtures are crazy expensive if you expect and semblance of quality. Great choice making one, and nicely done. bondogaposis THanks for the close-up and explanation. That is cool. Good idea with the mica on the sides, the accent lighting it provides is a great touch. Wow! This is a beautiful light fixture. Nice work!